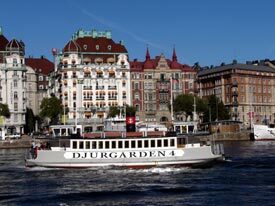 ABOVE: A vintage pedestrian ferry passes the Hotel Diplomat (the light building with gold awnings) on its way between Nybroplan and Djurgården. Hotels like the Diplomat (top photo), the Grand, and the Radisson Blu Strand are convenient to sightseeing, shopping, and transportation. They also let you enjoy the boat traffic and vistas along the city's clean, attractive, and lively waterfront. Stockholm's old town is an attractive melange of narrow streets, busy restaurants, and small shops. The Royal Palace is located here, and you can easily reach downtown Stockholm on foot or by a Tunnelbana subway line. The First Hotel Reisen is a great choice in the upscale category; for something different, try Mälardrottningen, a floating hotel in what once was Barbara Hutton's yacht. Much of the area around Stockholm's central railway station was torn down and replaced by modern buildings in the 1960s, so atmosphere isn't this district's strong point. Still, if you're in Stockholm for only a day or two, a centrally located hotel such as the the Nordic Light or the Nordic C (home of the famous Ice Bar) is undeniably convenient. If you've got money to spend, reserve a room or suite at Berns' Hotel, a stylish boutique hotel that's just outside the business district near department stores and the Berzelii Park. This large island just to the south of Gamla Stan is reasonably convenient if you're staying at a place like the Hilton Stockholm Slussen, or the Clarion. You'll probably end up taking public transportation to many of the sights. But in the evening, you'll find an endless choice of bars and restaurants in Stockholm's trendiest neighborhoods (including "SoFo," which is south of Folkungagatan and east of Götgatan). Scandic Hasselbacken, on the museum and park island of Djurgården, might be appealing if you're honeymooning or traveling with children in the summer. The STF af Chapman youth hostel (a converted three-masted sailing ship) is worth the walk to Skeppsholmen if you'd like to be near the town center but can't afford a room in Blasieholmen, Östermalm, or Gamla Stan. To serve time without a crime, book a cell at Långholmen on the park island of the same name; the converted 19th Century lockup also has an STF hostel on the premises. For other places to stay in Stockholm, see the listings at Booking.com, our hotel partner. Booking.com is Europe's No. 1 reservations service, with a "guaranteed lowest rates" policy and a secure booking system to protect you against credit-card fraud.